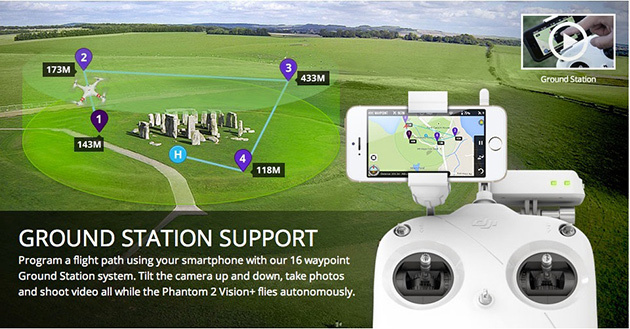 DJI has released the Ground Station function for Phantom 2 Vision and Phantom 2 Vision+ drones. This function will be available within the updated DJI Vision app for iOS and Android. The DJI Vision app is being updated to iOS v1.0.41 and Android v1.0.50. Planned flight missions of up to 16 custom waypoints. 3.1 miles (5km) flight distance limit. Ground station is automatically disabled when the Phantom battery level falls below 30%. 1640ft (500m) maximum flight radius from HOME point, 656ft (200m) altitude limit. Important: Ensure that your Phantom is running the latest firmware v3.04.